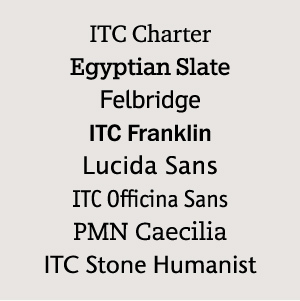 Until several years ago, when it came to setting text copy, sans serif typefaces were the typographic underdog. Some experts still advocate against using them smaller than 10 point. The criticism of sans serif typefaces for text copy falls into two general areas, both concerning ease of reading. First, many typographers have maintained that serifs help to guide the reader’s eye across the page. This would be true if the eye moved across a page in one smooth sweep. It’s been proven, however, that we jump from one series of words to another, in what are called saccadic movements – and serifs have no effect on this way of reading. Second, some designers believe that the monotone appearance of many sans serif typefaces tends to tire the eye in lengthy text composition. Although there have been no definitive studies to confirm this belief, most typographers agree that a large block of copy set in a typeface such as Frutiger Serif, with more prominent contrasts in stroke thickness, is more inviting than copy set in a monoweight design such as Futura. Good choices for hardcopy text. While some studies suggest that serif typefaces may be more readable than a sans in print, findings regarding on-screen typography favor the use of sans serif type – or a small group of robust serif designs – for text copy. Good choices for onscreen text. As with many matters typographic, the best choices are those that are most appropriate to the usage and the reader. If you are setting large blocks of copy intended for continuous reading in hardcopy form, a serif typeface might be a good first choice. 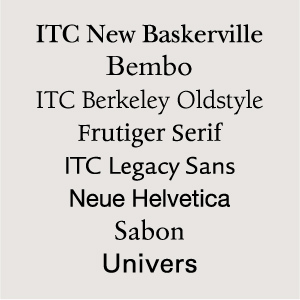 If, however, you are designing a parts list, directory, or other document where information will be looked at in small blocks of copy in an onscreen environment, a sans serif typeface may be your best choice. If your project will be typographically number-intensive, serifless designs often provide the best options, because the figures in sans serif typefaces are usually very highly legible. Sans serif figures are generally more legible than those from a serif typeface.